It’s summer, and the heat is on in full force. Heading to the pool is one of the best ways to cool off. Ever dreamed of swimming in the pool with your fishes? Don’t try plopping a goldfish into your typical chlorinated pool. There is a new trend on the market: natural swimming pools. Instead of using chlorine to clean (or should I say disinfect) they use natural ecological processes to keep the water clean. These types of pools rely on lots of fast-growing plants, large surface area for good bacteria, and proper water movement. (Do these principles sound familiar to you?) They are basically a very lightly stocked pond with a large open area for you and your friends to swim. While you won’t be able to have a whole school of goldfish or tons of massive koi in the water, between 5 and 10 fish are acceptable depending on the size of the pool. These fish should not be fed as this will add more waste to the system. Goldfish are very adept at finding their own food in a system like this. If you add fish make sure you only add one gender as they are notorious for reproducing. The aim of these systems is to create a balance. With goldfish constantly reproducing, you’ll have a hard time doing that. Every natural swimming pool is different. They come in many designs from a traditional pool with the natural regeneration area to something that could easily be mistaken for a koi pond if it wasn’t for the diving board. I know that if I ever have the funds, I’ll be looking to install one of these beauties in my backyard. Natural pools are functional in the summer but are still an attractive landscape feature in the off season. I can post pictures here all day long. I love looking at these things because every single one is different. They also give me ideas for how I would design a natural pond. 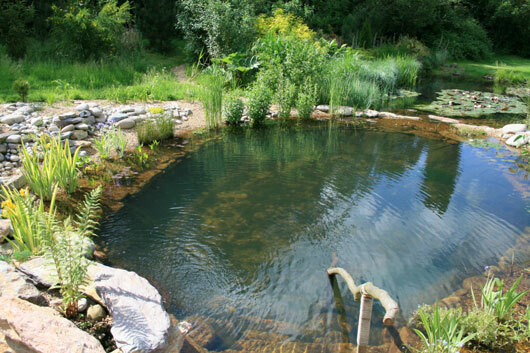 Establishing a natural swimming pool is an excellent way of providing a comfort zone in your place and at the same time creating a habitat for your fishes. Since a natural pool does not use chlorine and uses natural ecological processes to keep the water clean, your fishes can safely establish their sanctuary in your pool. 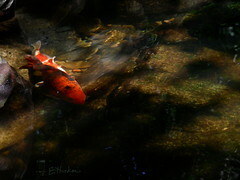 It is also a nice activity to immerse yourself in a body of water while watching your fishes swim. Wow! Beautiful pools! I would like to have these kind of natural swimming pool. Is it expensive to have that? Anyway, thank you for taking time to share this post. I hope I can read more great blog like this. Swimming with your fishes seems cool! Having a natural swimming pool is both fun and functional. Functional in the sense that it's a wonderful landscape idea that can definitely make your house a standout. And fun in the sense that... well, who wouldn't want to have a natural swimming pool right at their own backyard? :) This kind of pool will make you feel like swimming in the ocean or sea, which makes it more exciting. It’s simply wonderful to have a swimming pool in the home because of the many benefits that it offers.You can enjoy swimming in it during hot summer days, If the climate in your place has sunlight falling on the pool’s water it will disturb the pool’s chemical PH balance, which can produce algae on the surface of the swimming pool. When it is used by a lot of people at once or many times a day, it can get dirty. It is also possible for dust and insects to fall into it. Unclean pool waters are unhygienic and can cause health problems.So swimming pool cleaning is very necessary for healthy swimming.